Outlaw Star contains episodes 1-26. Collector's Editions includes a special metallic chipboard box inspired by the design of the spaceship with a hatch opening, plus a 100 page artbook! Gene Starwind is a jack-of-all-trades responsible for odd jobs and bounty hunting with his partner, Jim Hawking. Stuck on a rundown planet, he's going nowhere fast. But when a bodyguard job goes sideways, he finds himself the proud owner of the Outlaw Star and on an adventure to find the mysterious Galactic Leyline. Facing pirates and dangers galore, can he survive the journey through space? Special Features: Pilot Video, Trailer, Commercial Collection, Textless Opening and Closing Songs, and Trailers. As always rightstuf packages my boxsets very well and the boxset itself it amazing plus the bluray quality for an old series like outlaw star, FUNimation definitely did justice to this set. If I had to complain on something though it would be the way you open the box cause if all the blurays and stuff wasn't in it then you would have to be careful when you hold it. Other then that I love it YAY!!! It's a nice set that brings back nostalgia from when I was a little younger. You get the art box to house 2 blu ray cases, a nice booklet and a cardboard with a double sided picture of Melfina. Overall, not a bad set and I love the booklet as I love the booklet as it's a nice and thick and not some thin 20 or 30 pages one. Bought it at Funimation's booth at AX 2017. Been waiting a long time to get this series since I missed out on the DVDs. Was licensed by Bandai and the DVDs [both single and Anime Legends] were pricy. Vendor at AX had both selling for little over a $100. Funimation did a good job releasing this. Does come in a normal edition, but the Collector's Edition is where it's at. Comes in 2 Blu-ray cases [1 for Blu-rays and 1 for DVDs], a 100-page artbook which is pretty nice, and a double sided pic of Melfina to prevent your Blu-ray cases and artbook from moving in the box. The Blu-ray/DVD reversible cover art is nice, but the DVD version is a lot nicer. Most of the extra content is on the Blu-ray, DVD just have trailers. Only nitpick is the box is not metallic. It just hard cardboard. Not a big deal since the box is really cool. Overall, it was worth the wait and I highly recommend this series if you watched Cowboy Bebop and want something similar, but with more laughs. And to think I call this man Captain. A show marginalized by the titan that is Cowboy Bebop. However, that doesn't make this tour de force any less enjoyable, memorable, or impactful. And with the blu-ray transfer it's the best it's ever looked or sounded. 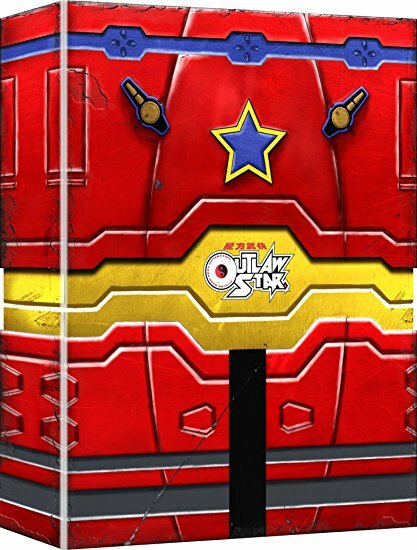 Outlaw Star is one of my all time favorite animes, and this Collector's Edition does it so much justice. Such beautiful art on the bluray covers, and such amazing detail on the restored visuals. Everything just pops. It's such a shame a series this great gets overshadowed by Cowboy Bebop. Like most I bought this set due to my nostalgia for Outlaw Star, and hey, having a really good sale price for it doesn't hurt too much either, am I right? Cheap plugs aside, I'm ecstatic about the overall presentation of this set. 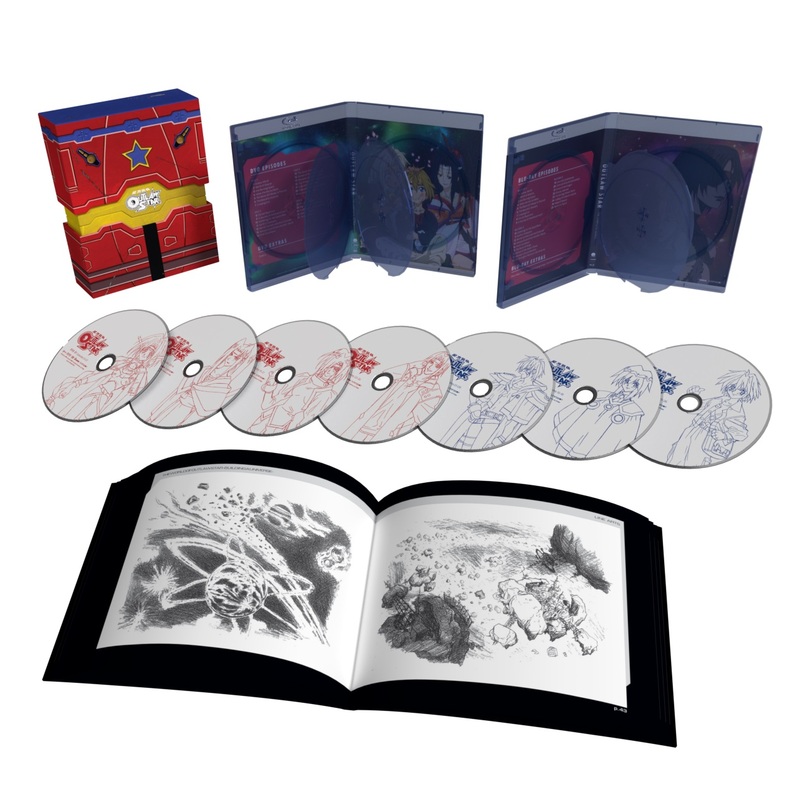 From the pull-apart Outlaw Star (the ship) motif to reveal a cardboard Melfina insert, to the two cases each housing the Blu Rays and DVDs respectively to the really well-done artbook included, this set feels well worth just about any asking price it garners. Overall, I'm extremely happy to see one of my favorite anime from my childhood as well as I wouldn't say underrated but more so an overlooked series, has been given a kind of resurgence so that this current generation and possibly and hopefully future generations of fans can discover and be captivated by it just as the fans who first saw this wonderful series X amount of years ago have been. Outlaw Star was one of the first anime I watched and it will always be one of my favorites. I say this because I may be a little biased in writing this. I love this set. The packaging is really cool and the extras are great. The video quality is top notch and a good upgrade from my anime legends dvds. The aspect ratio is 4:3 like it should be and the picture is crisp. I am so happy that they kept the original aspect ratio. Is it worth double the price? Probably not but if you are a fan or if you can get it at a discount this set is well worth it. I'm surprised it took until now for Outlaw Star to get a blu-ray release. I assume with the success of the Cowboy Bebop blu-ray, Funimation has decided to dip into the Toonami classics. The transfer is pretty well done. Given the show's age and the fact it was on hand-painted cells, you can see the the grain on every frame. It's not distracting though. It's like watching an old movie on celluloid. My only gripe is Funimation always skimps on the on-disk special features. The art book sort of makes up for that. Still worth your time. Highly recommended! Starwind and Hawking Enterprises is open for business! Like a lot of the other reviewers of this set, this show carries a lot of nostalgia with it. I absolutely loved the show back when it first aired on Toonami and I am so happy I can own it now. I love how Funimation did right by this series. The collector's box is great for all the fans out there with a gorgeous artbook, an artistically designed case, and a bonus cardboard/poster board insert of Melfina while navigating the Outlaw Star. I also like how they designed the covers for both the Blu-ray and DVD cases and allowed them to be reversible (the Blu-ray has sleeker, edgier artwork while the DVD has softer, sweeter artwork). If I had to make a complaint, it would be that the box can't close or stand up on its own without everything inside of it. I normally like to have the disc cases stand outside of their respective collector's boxes as they are easier to access and make it easier to store them on a bookshelf. Other than that I absolutely love it and I am very happy to own it. I remember watching this show so much when it ran on Toonami. Then for the longest time living in regret since the original DVD collection was not the cheapest. Then BAM, bluray/dvd rerelease! Bought it during a sale and been enjoy all of the uncuts and the one unaired episode. FOR THE CTARL-CTARL EMPIRE! This is a great collection for any Outlaw fan, the box is amazingly designed and the art book is and excellent bonus. This is a must have for any fan. Quality box set for a great classic series. This box set contains the the complete series on both Bluray and DVD. Along with a well constructed art book breaking down the design of the central characters, locations, and the ships. There's also a collection of digital goodies like textless openings.